Clenching the teeth, a tight jaw, ear aches and headaches can all be attributed to TMJ Syndrome. 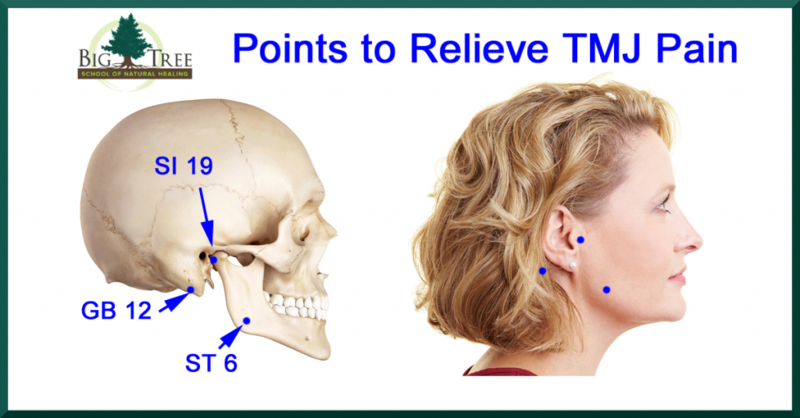 Let’s have a closer look at TMJ before diving into the acupoints that are indicated for relief. TMJ stands for Temporal Mandibular Joint. This is the scientific name for “jaw joint.” The movable part of your jaw is the mandibular bone. 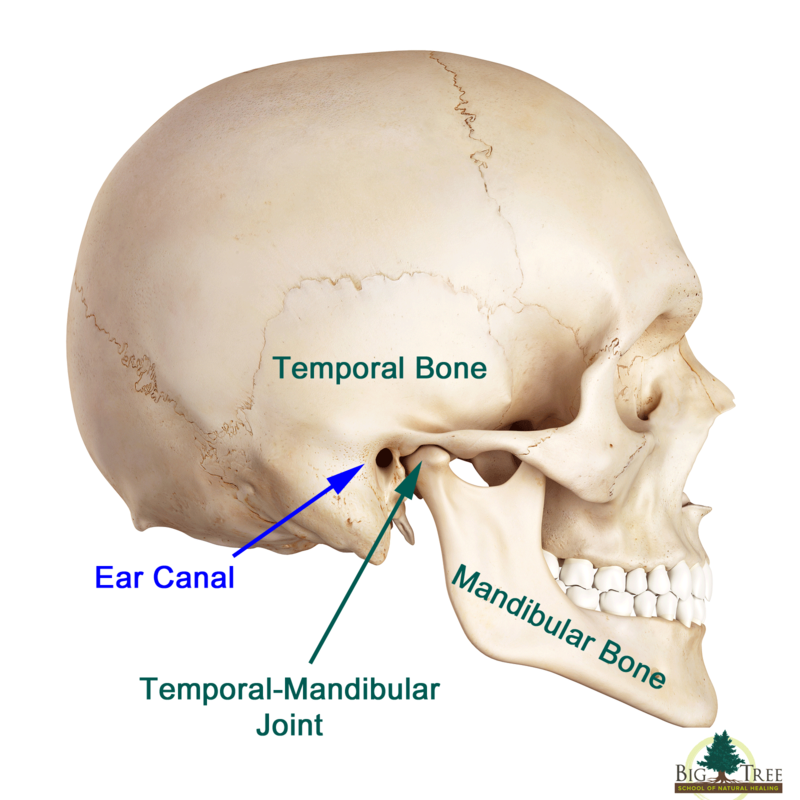 The bone that the mandible connects to on the skull is the temporal bone. Joints are places where two bones meet. TMJ Syndrome is the name for the pain that occurs at the temporal mandibular joint. This pain may reflect damage to the joint and/or tendon, and muscle pain related to the joint. Tight muscles can pull the jaw out of alignment (the jaw connects on both sides of the skull). Too much tension on one side of the head can pull the jaw to one side, which may set the stage for joint trouble as time progresses. Therapeutic massage to the muscles of the head, face, and jaw is very helpful for relieving the muscle tension that may be pulling the jaw too far to one side. 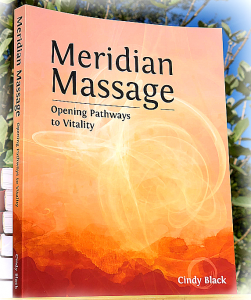 Massage can also help alleviate the mental-emotional stress that may be contributing to the tension in these muscles in the first place. 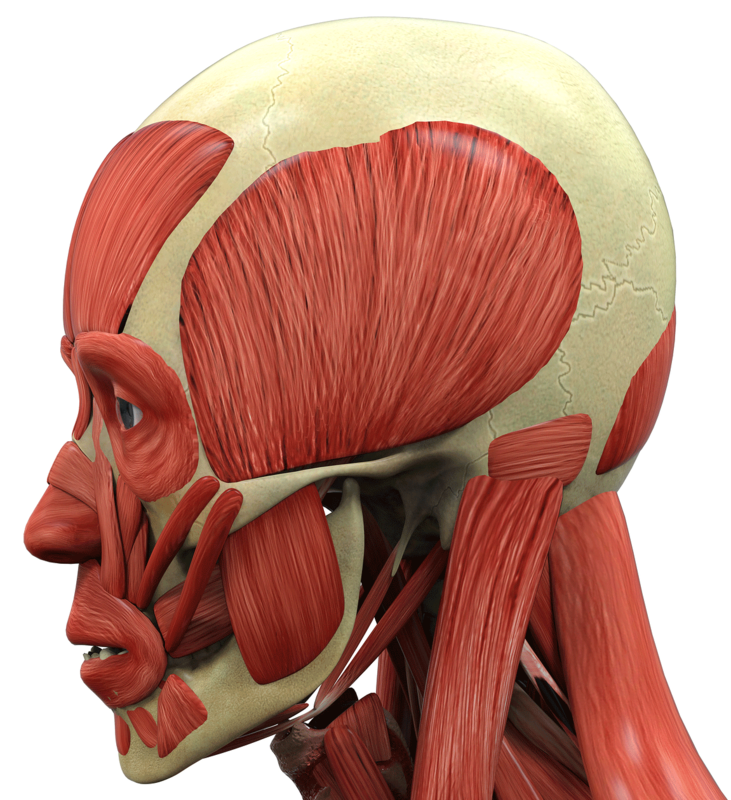 Below is a picture of some of the muscles on the head and face that move the jaw. When these muscles relax and soften, the pressure on the joint is relieved. Once the pressure is relieved, space returns to the temporal-mandibular joint, which sets the stage for healing. Using acupressure for TMJ can be very beneficial! Next, I will show you some points to relieve TMJ pain. Apply gentle pressure to these points on both sides of the head. I like to add in small circular massage to these points to help move the energy. The combination of massage to the muscles of the skull and focused attention to these points can help relieve the pain of TMJ. Stress often presents as Liver Qi Stagnation. This is a pattern of imbalance from the Chinese medical perspective. Read more about Liver Qi Stagnation by clicking here. Watched the replay of your Acupoints and loved it. Now this! I recently bit down on a raw almond and irritated my TMJ so how perfect this is! Thank you for your generous sharing. Great timing! I hope your jaw is feeling better. Love this information from Cindy as always. The graphics are easy to understand, concise information plus links for more is always there. Thanks so much for this post! I hope I have your permission to share this to my clients too. I will give these points some massage on my Daughter I’m thinking about her seeing a Bowen Therapist as It may help her with Tinitus.. We have tried just about everything , she has been seeing a very good Chinness Acupucturist he has helped her a lot but it’s been a six year Journey and she has just been told that the hospital cannot help her further, She has high anxiety and won’t leave the house and is being given seven cocktails of antidepressants , she is 27 . I have been an Holistic Therapsit for 17 years it’s so frustrating I feel I’m failing although the emotional issues she has with her Father ( re married , no time ect, full time Musician , always away ect ect.. ) these are the only issues I cannot change , even though I have tried !! She lives with it although..! I offer her Spinal touch , I make her creams as her exzema goes through the roof if she doesn’t look after her skin, but often she won’t use them as her skin is too sensitive, I offer her to inhale Bergmont oil to ease the axiety as she cannot tolerate it as a medium for massage , in any kind of oil or creams !! Thanks for sharing this information. The physiotherapists at our clinic also use medical acupuncture in our practice and we use your site as a resource when we are looking for good acupuncture points to choose for musculoskeletal conditions. So thanks for your information. We were particularly interested in reading about your TMJ article. I noticed that you mentioned that stress can play a role in TMJ Dysfunctions. Would it be worthwhile to also choose some auto regulatory points to calm down the nervous system such as GV24.5, CV 17, L14, GV20. With our experiences (in the physiotherapy world) we find that TMJ dysfunction is closely related to forward head posture, neck issues and even spinal/pelvis issues can relate back to the TMJ. We look at all of these when treating a stubborn TMJ condition. When addressing stress reduction, I find it is best to approach each person and their particular set of circumstances. Alleviating stress is a cooperative venture between the therapist and the client – we always work together to find the life style adjustments that suit that person best. Because there are different patterns of stress, I like to use Yin and Yang and the 5 Elements as ways to understand what is going on , and to craft an approach. Thanks for you additional thoughts from the Physiotherapy perspective, that will benefit is us all. Not to get off topic, but is ther any meridian points you can offer for someone who is experiencing terrible migraine headaches, sensatvity to light and nausea? I would truly appreciate it. Cindy wrote an excellent post regarding headaches. 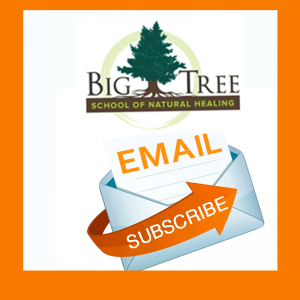 Please check out https://bigtreehealing.com/5-points-to-relieve-a-headache/. In addition to the blog post that Kc referred to, I would a few more resources to look at. 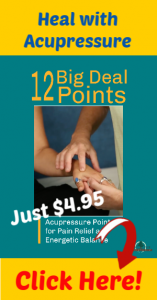 Combining P 6 with Ren 17 is a good point combination to relieve built up emotional tension that may contribute to headaches, even migraines – here is a post about Ren 17 https://bigtreehealing.com/easing-heart/ In practice, maintain contact with Ren 17 and P6 on one arm, settle you attention on these points and feel for a relaxing of the breath, then hold Ren 17 and P 6 on the other arm, again, feeling for your client to relax their breathing. I always work the feet in the case of migraines – this helps to bring the energy down. Thanks for sharing this information on acupoints! Well Done Cindy. Thank you for sharing! 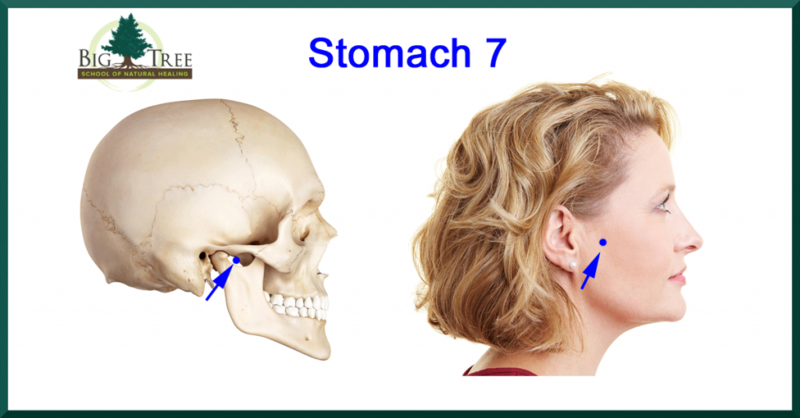 Thanks for sharing the acupressure on TMJ points. What a coincidence..have been doing it for my Dad whose got a tight locked Jaw and finds relief.Well done Cindy.Superb work.